Huawei Honor 7 vs. OnePlus 2 - Which one to for? Huawei launched Honor 7 in June, 2015 claiming to be 2016 flagship killer. 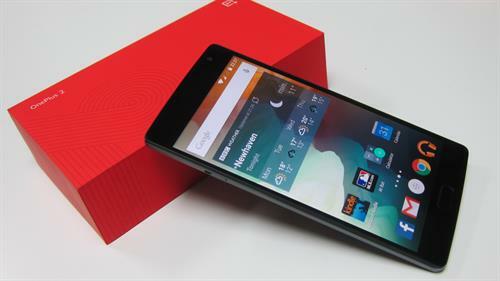 But giving a tough competition OnePlus also launched another smartphone continuous to their smartphone series based on number which is claims to be best smartphone of 2016 - OnePlus 2. In terms of design both the smartphones are well built and come with aluminum construction. Honor 7 follows its tradition of design whereas OnePlus 2 comes with some modifications. Huawei Honor 7 comes with 5.2-inch IPS-NEO LCD capacitivie touchscreen with 1080 x 1920 pixels and 424 pixels density. Its display is Cristal clear and performs good in bright sunlight as well. Looking at the design of the smartphones then it is fully made up of Aluminum to reduce weight and give better protection as well. You don't get any display protection in this smartphone whereas OnePlus 2 comes with Corning Gorilla Glass 4 to enhance protection. At the same time, OnePlus 2 comes with 5.5-inch LTPS IPS LCD display with 1080 x 1920 pixels and 401 ppi. It also performs very good in all the conditions but comparing it to Honor 7's display it is bit outdated. OnePlus decided to go with same OnePlus 1 display in OnePlus 2 whereas everyone was expecting upgrades. You get a brilliantly made aluminum body which gives very good looks and protection as well. You get Corning Gorilla Glass 4 display protection. As per users review its display protection is not up-to the standards and there smartphones are getting damaged from just a small fall. OnePlus 2 comes with Gorilla Glass protection but it can't be even compared to Motorola Moto E. Looking in the terms of display and design - Huawei Honor 7 is a clear winner with its great display and design. Nowadays smartphone's performance is the main concern of buyers. Even cheap smartphones comes with good hardware specifications. Huawei Honor 7 comes with HiSilicon Kirin 935 processor with Dual Quad-Core CPU with 2.2 GHz and 1.5 GHz. It is quite good in terms of performance. Apart from this honor 7 comes with 3 GB RAM. All the graphical processes on this smartphone are handled by Mali-T628 MP4. Gaming performance on this smartphone is not good as OnePlus 2 but in terms of Multi-Tasking it performs better. Honor 7 comes with two storage option of 16 GB and 64 GB. On the other hand, OnePlus 2 comes with Qualcomm's most advanced Snapdragon 810 processor with two RAM option based on storage option - 3 GB RAM and 4 GB RAM. Applications based on graphics work with Adreno 430 GPU which performs pretty well. OnePlus 2 is very good in multi-tasking and Graphical processes as well. You get storage option of 16 GB and 64 GB. 64 GB variant of OnePlus 2 comes with 4 GB RAM whereas you will get 3 GB RAM in 16 GB variant. OnePlus 2 performs good over Huawei Honor 7. If your main concern is smartphone's performance then go for OnePlus 2. Just after performance, everyone's main concern is Camera. Nowadays every smartphone comes with good camera specifications. Both of these smartphones comes with high tech camera for capturing your precious moments. Huawei Honor 7 comes with primary camera of 20 MP with resolutions of 5152 x 3888 pixels. It comes with front camera of 8 MP which is more than required to capture selfies. Apart from all these it also comes with Geo-Tagging, touch to focus, face detection and other advanced features. OnePlus 2 comes with primary camera of 13 MP with 4128 x 3096 pixels whereas secondary camera is of 5 MP. You get same camera specifications as Huawei Honor 7 but you will get laser focus which focuses image in 0.02 seconds. Both the smartphone comes with optical image stabilization facility which helps in getting better images. With 20 MP and 8 MP camera Honor 7 wins over OnePlus 2. Nowadays most of the smartphones comes with manufacturer's UI based firmware which comes with bloatware applications which decrease performance of these smartphones. Huawei Honor 7 comes with Android v6.0 (Marshmallow) with cosmetic changes using Emotion UI. Honor 7 comes with Dual-SIM support but if you want to use microSD card slot then you will be able to use single SIM and memory card. Apart from that it comes with latest connectivity technology of 4G. Operating System performs good and easy to use. OnePlus 2 comes with Android v5.1 OS. OnePlus named their operating system as Oxygen OS. You get Dual SIM functionality in OnePlus 2 as well but with no microSD card slot. Previously, OnePlus smartphone were launched with Cyanogen OS but due some conflicts they are now manufacturing them with Oxygen OS. Looking at performance based on hardware. OnePlus 2 is much better than Huawei Honor 7. Their Oxygen OS is much similar to Cyanogen OS with stock Android UI and minimal bloatware application. If you are power user and are looking for performance based smartphone then you should go for OnePlus 2, whereas in terms of Camera and Display Huawei Honor 7 is better than OnePlus. You can buy OnePlus 2 at Rs. 25,000 from Amazon. You can buy Huawei Honor 7 at Rs. 3,000 less. Honor 7 is priced at Rs. 22,999 exclusively on Flipkart. For any further queries feel to comment here. Huawei Ascend D2 is the latest smartphone by Huawei. This article gives you all its features, specifications and a review. Read on the article to know the details, price and availability of Huawei Ascend D2. Are you looking to buy Huawei Ascend D2? This smartphone runs on Android Jelly Bean OS. Read the article to know the features, specifications and price of Huawei Ascend D2. Huawei is all set to launch the new Ascend P2 smartphone next month. If you are looking for this latest smartphone from Huawei, then you have come at the right place. In this article, read about its features, specifications, price and our review. Are you thinking of buying Huawei Ascend P6, the world's slimmest smartphone with the thickness of 6.18 mm and with a large display size of 6.1 inches? Your wait will soon be over, since Huawei has launched Ascend P6 on June 18 and it will be available for sale from July 2013. Though the official price is not known, Huawei Ascend P6 might cost around Rs.20,000 according to rumours about its price. Read this article to know its review, features and specifications. Read the detailed review about Honor 4X, the new budget 4G Android smartphone from the Huawei. This budget-friendly device comes with a lot of eye-catching features at a price tag of Rs.10, 499. Lets find out the new features it is offering at this affordable price.